One good thing about having to let go of the hype and more extensive traditions of Christmas this year is that I’m freed up to think of simple ways to celebrate with my kids. By simple, I really mean it. We have gone to, maybe, three stores since Thanksgiving, so my kids’ expectations of what Christmas should look like is limited to the splendor of Grammie’s house (which is beautiful, by the way. I get away with our three candles and stockings by saying , “isn’t it special that Grammie has such a pretty house for Christmas?”) They also haven’t been exposed to society’s excess of want-want-want and sugar and rush. We don’t do Santa , so all of that combined means less doing and more…resting. On the couch. Or better yet, in my bed. 1. Pointing out symbolism. Symbols can be tricky for kids, but I found that Micah can grasp it with a visual. Today he had a candy cane cookie, and we talked about how the candy cane reminds us of the shepherds. God must have thought they were special because He sent the angels to announce Jesus’ birth to them first! The candy cane also reminds us of Jesus dying on the cross for our sins – red for His blood shed for us and white for His purity taking our sins away. We also talked about stars – the star on our tree or as a decoration is a reminder that God placed a star above the stable when Jesus was born. The wisemen followed the star, knowing they would find a King under it. Snow (we don’t actually have any of this, but we made paper snowflakes) can symbolize Jesus’ purity when He came to earth. He was completely sinless, which is why He could die for our sins. There are an abundance of symbols during this season! 2. Hand crafts. 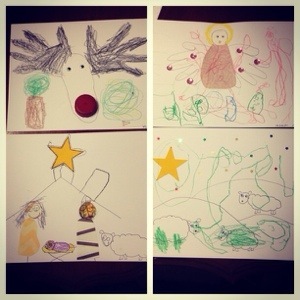 I’m not brave enough to do paint right now, but I have been tracing their hands to make Christmas pictures. Hands can be angels’ wings, a Christmas tree (symbolizing that God lives forever and ever, just like the pine tree that doesn’t die in the winter), wreaths, and other fun things like reindeer antlers and Santa beards. I do the tracing and they do the coloring and glue sticking. Easy, sitting craft for me! 3. Singing. There are a lot of beautiful Christmas songs about Jesus. Not that the others are bad (I love the Michael Buble Christmas album! ), but we’ve been mostly singing the Jesus ones. My kids love them, especially Norah. I catch her singing them to herself all the time. 4. Reading. We have the Beginner’s Bible and the Jesus Storybook Bible, and we read the Christmas story out of both very often. It doesn’t seem to get old, and the kids like to talk about what animals they think were there and how the shepherds responded to the angels. Norah always sings Angels We Have Heard On High when we get to the shepherds part. I like the amount of time we have spent reading (or just telling) this story because I see them really remembering it. I’ve also found little baby Jesus’s drawn all over the place. 5. Nativity play. We have a felt nativity set that I leave out for them to play with, and my mom has the adorable Little People version, complete with the innkeepers and a hundred animals. We like to play the story and I let the kids imagine what it was like. 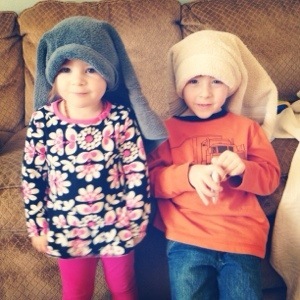 The other day they put towels on their heads and pretended to be shepherds (and then Micah was a sheep and there was some priceless snuggling that happened). It’s fun to play it with them and then watch/listen to them play it. They are catching the story, and it is special to see. These things are super simple, but they have been good celebration for us. Easy, relaxing, and above all, full of truth and investing in my kids ‘ hearts. What do you do to keep Jesus in the middle of your Christmas celebrations?